Steve Vernon is an author who writes like no one I have read thus far. His freedom with the written word is astonishing. It’s as if every thought he has spills out onto paper and has to be shared. Every dark thought, as applies here. Sudden Death Overtime does not fit my usual reading, because horror is not a genre I particularly enjoy, but I expect this is a dark fantasy unlike most others. This book (novelette because it is short) is sure to satisfy readers who like this genre, but it is not for young readers. Steve Vernon writes well. His capturing of human nature and the could-care-less attitudes in conversation are true to life, including the coarse and vulgar language between men who are less than etiquette conscious. His imagination is spooky, in this case, horrific! There is a totally black tour bus that shows up in odd places in a northern Canadian community and people start disappearing. There are four old men who still love hockey enough to clear the ice every Saturday for the kids in the community. There are vampires … and those determined old men … and hockey … and gore. And a twist at the end. If you like hockey, vampires, horror, dark humour, and you don’t mind coarse language, then you will like this book. Steve Vernon has them all in Sudden Death Overtime. It is a short read that packs a wallop. 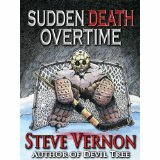 You can find Sudden Death Overtime listed on my BUY THE BOOK! page. This entry was posted in Mostly About Reading, Reviews & Interviews and tagged dark humour, fantasy, hockey, horror, northern Canada community, Steve Vernon, Sudden Death Overtime, vampires. Bookmark the permalink. Liked Mr. Vernon’s “Sinking Deeper: Or My Questionable (Possibly Heroic) Decision to Invent a Sea Monster” very much! I agree – great writing style! Thanks for contributing to the conversation, Erik.